When a cargo ship carrying several hundred Sri Lankan refugees arrives off the coast of Vancouver, those aboard hope for a new beginning in Canada. The problem? You just can’t walk into the country (or sail in for that matter). There’s a long, drawn out process in claiming refugee status and it doesn’t always work out for those in need. In The Boat People, author Sharon Bala takes inspiration from a real life incident in 2010 to shine a light on that very process spotlighting the refugees, the immigration lawyers, and the adjudicators involved. For someone who often reads horror and violent crime fiction, the subject matter in The Boat People weighed heavier on me than some of the more extreme novels I’ve read in the past. From the inhumane conditions aboard the ship to the emotional trauma experienced by separated families, Sharon Bala just ripped my heart out. Unfortunately, I didn’t find this to be a good read in terms of an engaging story. Generally, I read a lot of plot-heavy quick-moving thrillers and mysteries, and this very much felt like the opposite. Although I’m usually open to reading new genres and authors, I struggled so much with this book. I found that out of the three storylines Bala presented, the only one I really cared about was that of Mahindan, the refugee who had been separated from his son upon arrival. I would have almost prefered to watch a documentary about the Tamil Tigers (terrorist group in Sri Lanka) and the Civil War that caused the refugee crisis. I know that sounds lazy, but I’ve found lately that if a book doesn’t grab me within the first one hundred pages, whatever remains looks like an impossibly tall mountain to climb and that usually adversely affects my enjoyment. 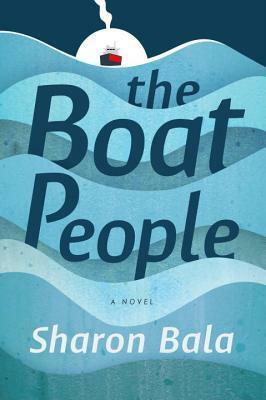 The Boat People absolutely belongs in the Canada Reads competition given its message – that it shouldn’t be “why they should go”, but rather “why they should stay”. I just felt the execution could have been better. Sharon Bala’s heart was in the right place but given that this is her first novel, I can only imagine that she will grow better with time. oh, what a shame this loses in the execution! When I saw The Boat People on this year’s Canada Reads, I immediately added it to my TBR since immigration is such an important topic these days – and will remain so, I think. Of course, I’m especially interested in the Canadian immigration experience. Now I’m not sure: do I take the time to try this? Thanks for sharing your thoughts, Brandon. Hi Debbie, I think it is an important read in that I believe Sharon did spotlight the problems with the Canadian immigration experience. Unfortunately, I just didn’t enjoy it personally as it didn’t move quite quick enough to hold my attention at times. I seem to be in the minority though as most people I’ve seen on Goodreads have rated it quite highly.